Check out our smart tips on how to save energy and money in Georgia when you gather family and friends ’round the turkey! Every year, American natural gas usage spikes over Thanksgiving. 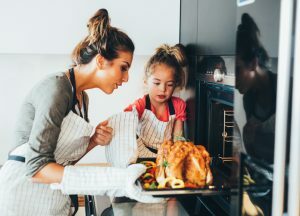 Furnaces work overtime to keep homes warm, and ovens are kept running for hours to get that turkey cooked to perfection. Nobody wants to cut back at Thanksgiving, but there are some clever ways to save on your natural gas bill this November. Few turkeys are finished off on Thanksgiving. In fact, most families seem to spend the next few weeks eating up leftovers – turkey sandwiches, turkey pie, turkey casserole, anything to use up the spare bird in the fridge. Instead, why not opt for a smaller turkey on the day? It’ll cook far faster, cutting down on the amount of natural gas you use, and you certainly won’t have to go hungry. Don’t cook side dishes separately. If you’re running the oven for a few hours, it makes sense to cook as much as possible at the same time. Throw in your potatoes, stuffing, and other side dishes to cook while the bird’s roasting. You’ll find that this saves oven time and helps to conserve natural gas, a perfect way to save a few dollars this holiday season. All gas-powered appliances are given an energy efficiency rating. This is displayed on a yellow Energy Guide sticker that tells you the approximate annual running cost, and the appliance’s efficiency. Older, outdated models tend to use far more natural gas than newer ones, leading to higher gas bills. Currently, there is no residential ovens, ranges, or microwaves qualify for the Energy Star rating. However, even if your stove has been working perfectly for years, it may be worth replacing it with a newer model that uses much less natural gas. This may surprise you – dishwashers use a lot less water than hand-washing does. Energy Star certified machines can use half the energy that washing by hand does, and if your home’s boiler is natural gas powered then this means a saving on your natural gas bill. If you’ve got the whole family coming round, you’ll want your home to be the perfect temperature all evening. Human bodies tend to put out a lot of heat so when you’ve got everyone gathered ’round, you can turn down the thermostat by a few degrees. Not only will you save energy but you’ll also keep your guests comfortable. We also recommend checking out a few of our tips for keeping your natural gas furnace working efficiently this Thanksgiving. If you want a quick and easy way to minimize the costs of this holiday season, the best thing you can do is find a cheap natural gas deal on Georgia Gas Savings. We find the best rates from every marketer in the Atlanta Gas & Light service area, giving you the best prices on the market as well as real customer reviews. Keep money off your mind this holiday season, and focus on what really matters.